Former Secretary of State Gen. Colin Powell tells a story of when he was a young lieutenant in the Army. A veteran non-commissioned officer told him, “Lt. you’ll know your people trust you when they follow you even it’s only out of curiosity”. 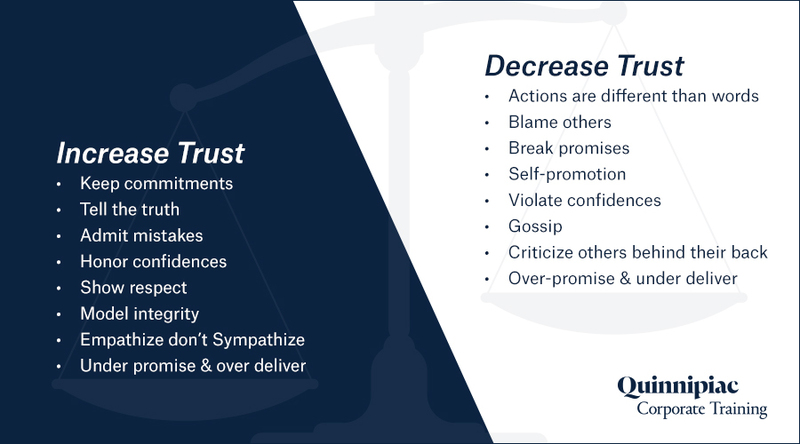 For teams and organizations to function at the highest level, a proportional level of trust needs to exist. The higher trust among team members - the higher their potential level of performance. Leaders create this climate by displaying consistency in their actions, and through relationship-building behaviors like coaching, counseling, and mentoring. Increasing a team’s trust is an active, not passive, process. The most powerful tool a leader has to accomplish this is their own personal example. Greater trust leads to improved organizational climate and engagement. Grandiose speeches at the annual company meeting, or giving someone a “whitewashed” positive performance review don’t build trust. Additionally, the belief a team places in its leader comes with an expiration date that will quickly be reached unless it’s consistently refreshed and renewed. Trust develops each day through the actions a leader takes and their interactions with the team. The level of trust within a team can be improved (or degraded) based upon those actions and interactions. Low levels of trust usually spring from some underlying issues. It might be because people on the team are too anxious to deliver unfavorable news. Others might be unable to say “no” at the appropriate time, leading to unrealistic expectations and missed outcomes. If the team and leader consistently avoid conflict because they are uncomfortable with how others will respond to the truth, trust is negatively affected. In the worst of cases, the team members or leader are overly focused on personal ambition and place their individual goals and aspirations ahead of all others. If the previous description reminds you of your workplace, what can you do about it? What can you do if it’s a team you lead? First, picture your team’s level of trust like an old-fashioned scale. Each action taken, adds “trust mass” to the positive (increasing trust level) or negative (decreasing trust level) side. These actions could be small or large but the cumulative effect is the trust level will lean toward the “I believe in you” or “I’m not so sure about you” side. 1. Keep your commitments: Tell people what you are going to do and then make sure you accomplish it. Remember results matter. Results don’t matter at all costs, however, having a great plan but then failing because you didn’t take the actions promised is a surefire way to drop trust levels. 2. Tell the truth: No matter how hard it is for someone to hear, or how upset you think they will be. 3. Admit mistakes: People generally think well of others who use candor. 4. Honor confidences: If an individual or group shows their belief in you, make sure you have the conviction to keep it private. 6. Model integrity: The single greatest asset you have at your disposal is yourself. If you act in the manner the way you want others to behave you should see some positive results pretty quickly. 7. Empathize Don’t Sympathize: Use empathy to understand a person’s situation vs sympathy. Empathy puts you in the other’s situation. Sympathy, while well-intentioned, comes from a place of superiority. Using the technique of “Feel, Felt, Found” is a great way to understand another person’s paradigm and engage them in empathetic communication. 8. Under promise & over deliver: By consistently exceeding other’s expectations and what you say you will do, people will come to know that your word is your bond. So go ahead and choose just one of these techniques and begin to work on it. If you focus on that one piece you'll build your team’s trust level and you'll be on the way to creating a group that believes in each other and can’t be stopped.